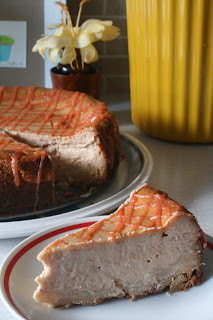 I finally got around to using up some of the 96 guavas I gathered a few days ago and made my first Guava Cheesecake. It's very very light but very very guava-y and very very good. Now I need to use up the other 70 guava (and counting) and the 45 star fruit and make jam or even just some pulp and juice to freeze for later use. 15-20 fresh guava, peeled. enough to make 1 1/2 cups of pulp. 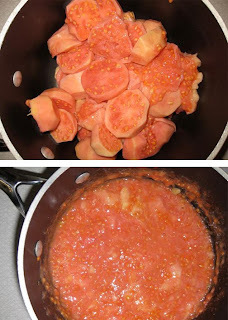 Place in a saucepan and cook until softened. 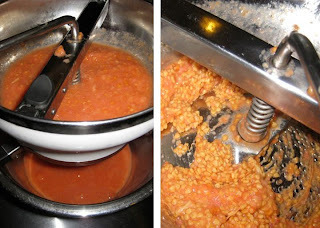 Place in a food mill to remove the seeds and fibrous bits. I usually run through twice. You can prepare this the day before if desired. Chill until ready to use. Press into a 9" spring form pan, going either all the way up the sides or half way as I did. Poke with a fork to avoid bubbling and to allow steam to escape. Pre-bake 350 for 10-12 minutes. You will see in the picture below I let mine go a little too long. 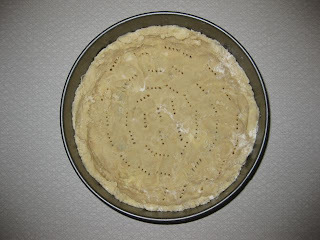 If you over pre-bake, the crust could end up burnt if the center of the cake is too thick and cooking slow. 1 cup fresh guava pulp, cooled to room temperature or chilled. Cream the cream cheese until smooth. 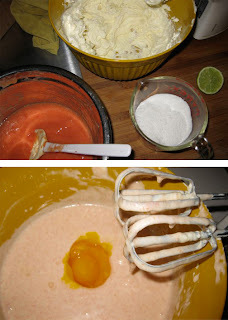 Add sugar, pulp, citrus juice and cream. Add eggs one at a time. Pour filling into slightly cool crust. Bake 350 for 40 - 60 minutes depending on thickness of cake. Let cake cool then refrigerate. Drizzle with glaze (see below) and serve. Make this after the cake has cooled. Blend together in a saucepan and simmer until bubbly and thickened. 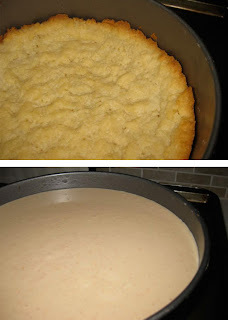 Allow to cool and place in an icing bag and squeeze over cool cake. 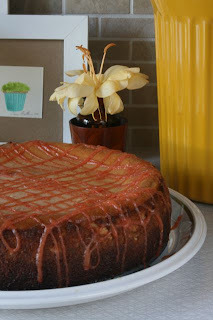 You could also just pour this glaze over the top of the entire cake then refrigerate at least 30 minutes. I believe that is the best use of guavas I have seen. I want to reach through the computer screen and devour this cake. 5 stars, gentlemen!!!!!! Well James… I did enough reaching for the both of us seeing as I reached into the fridge about every 15 minutes to sneak a bite. I cannot wait until my computer work station is out of the kitchen. Just posted a recipe on my blog that seems right up your alley.